Azerbaijan is brutally cracking down on human rights activists and journalists: Baku’s repression should be condemned much more widely. 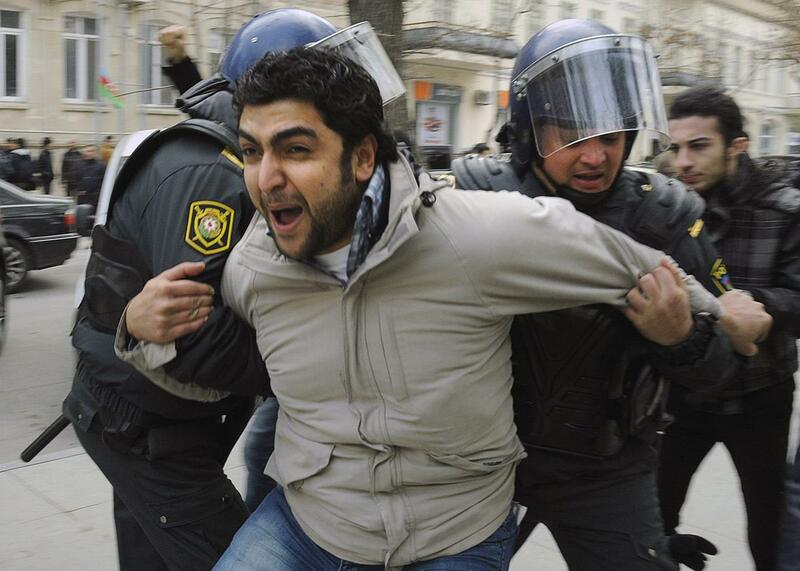 Azerbaijan is decimating its human rights activists, and why not? It’s faced almost no consequences for its repression. Azeri riot policemen detain protestors in central Baku, Azerbaijan, on Jan. 26, 2013. The Kremlin’s sweeping, anti-Western crackdown on freedoms in Russia has made headlines everywhere. Government-fomented anti-Western hysteria is at a height not seen since the Soviet era. The government’s witch hunt to ban “undesirable” foreign groups and donors has created a poisonous climate of fear and suspicion. More than 1,000 miles south of Moscow, a government-led crackdown is under way in another post-Soviet state, Azerbaijan. It hasn’t garnered the same attention or outrage, but it should, because this new wave of repression has decimated this oil-rich country’s human rights community. In my 24 years in human rights work in former Soviet countries, I have never seen a government this busy jailing human rights leaders, whose lives—and the lives of their families—are now in ruins. Many activists and dissidents have fled the country. In some cases the government has gone after the family members they’ve left behind. Azerbaijan has had a consistently poor human rights record, but starting in mid-2012, in an effort to silence independent voices, the Azerbaijani authorities began imprisoning dozens of political activists, human rights defenders, journalists, bloggers, and others on various trumped-up charges, including hooliganism, drug possession, and tax evasion. Like its northern counterpart, the Azerbaijani government adopted legislation that made it extremely difficult for independent organizations or civil society groups to accept foreign funding. Then, in spring and summer 2014, the crackdown hardened. Unlike Russia, the Azerbaijani government didn’t bother with first mobilizing the public through campaigns around “undesirable organizations” or “foreign agents.” It went right for the jugular: It opened criminal investigations against several international donors, froze the accounts of dozens of independent groups that had been their grantees, and arrested the country’s most fiercely independent and outspoken activist leaders. It’s been a year since the authorities arrested Leyla Yunus, who has been among the country’s most prominent human rights figures for two decades, and her husband, Arif Yunus. In rapid succession they arrested Rasul Jafarov, who led campaigns to leverage Azerbaijan’s hosting of such mega-events as the European Games and the Eurovision Song Contest to generate pressure to end politically motivated prosecutions. They jailed Intigam Aliyev, who pioneered human rights litigation in Azerbaijan, including at the European Court of Human Rights. A few months later, they arrested Khadija Ismayilova, the country’s leading investigative journalist. All remain behind bars. In the past few days, they have each appeared in court, in a rapid, revolving door of show trials. On July 21, Aliyev and Jafarov appealed their convictions on tax evasion and other economic crimes. Aliyev’s appeal was rejected and his seven-and-a-half–year prison sentence remains unchanged. Jafarov’s sentence was reduced by three months, to six years and three months. * On July 25, preliminary hearings began in Ismayilova’s trial, also on tax evasion, embezzlement, and other economic infractions. And hearings on the merits started on July 27 against Leyla and Arif Yunus, also on similar charges. The couple has also been charged with treason, but those charges will be heard separately. In hearings this week, the authorities allowed very few journalists and diplomatic representatives into the courtroom. Why did the Azerbaijani government choose this moment to radically clamp down and transform its civil society? The government started the crackdown in the wake of the 2011 Arab Spring, fearing the example it might set in this largely secular Muslim country. The 2013–2014 Maidan revolt in Ukraine, another post-Soviet state, almost certainly exacerbated those fears. Rather than address the root causes of potential public discontent—chief among them grotesque, epic corruption—the authorities went after people who give voice to discontent. It’s a sadly predictable strategy. And maybe Russia’s example emboldened the authorities in Baku. But maybe the more compelling answer is, simply: Why not? As the Azerbaijani government ratcheted up the arrests and repression, it faced no consequences. At the height of the crackdown, as the government was arresting the country’s human rights leaders, Azerbaijan proudly held the rotating chairmanship of the Council of Europe, Europe’s intergovernmental human rights organization. That is starting to change. In June, 25 states joined at the United Nations Human Rights Council to issue a statement marking concern about the crackdown and calling for the release of arrested human rights defenders, marking the first time Azerbaijan has been singled out in this way at the United Nations. The same week, the Parliamentary Assembly of the Council of Europe also condemned the crackdown and called for it to end. In April the Extractive Industries Transparency Initiative, which promotes good governance of resource-rich countries by fostering open public debate, demoted Azerbaijan because of the government’s failure to abide by the group’s rules, which require respect for fundamental freedoms. The Azerbaijani government can stop this pressure at any time: It can free human-rights defenders and government critics held on politically motivated charges. But until it does, more international action is needed, sustained over time, and across other multilateral organizations that have human-rights–related rules that Azerbaijan is so flagrantly breaking. Each should use the tools available—including more statements, the threat of exclusion from prestigious bodies, and the like—to maximize pressure on Baku and alter the government’s apparent calculation that it can carry on with its brutal crackdown at no price. Meanwhile, foreign embassies and representatives of intergovernmental organizations in Baku should all send representatives to these court hearings. That would deny the Azerbaijani government the opportunity to intimidate those who do. But more important, it would show moral support for the Yunuses, Rasul Jafarov, Intigam Aliyev, and Khadija Ismayilova, who have done so much to support the values that people who cherish their freedom and human rights hold dear.